ATTENTION: The Ambassador Program ended on 08/17/2017 and is no longer active. If you feel that a mistake was made and you should qualify for the Ambassador Program, please contact support@obsidian.net. Hello, everyone. Brandon here. I wanted to talk about the Pathfinder Ambassador Program. What is the Pathfinder Ambassador Program? This program is a thank you to all of the Pathfinder community members that have supported us over the past year. Obsidian would like to show its appreciation for your support by giving you an exclusive upgrade DLC for Pathfinder Adventures on Steam. This DLC will upgrade a base version of the Steam game to an Obsidian Edition - free of charge. ... all for the price of the base Steam game. We'd also like to offer our Ambassadors a 10% off coupon to help you pick up the base version of the game on Steam. 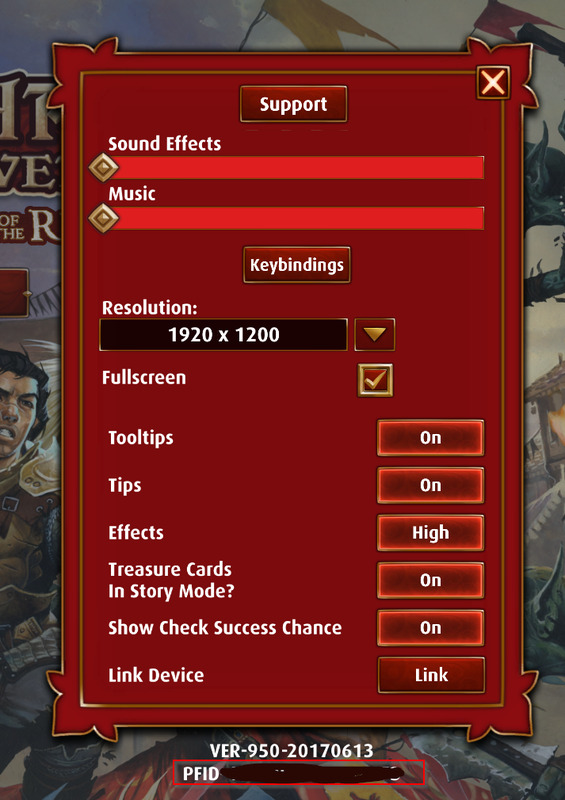 If you have spent $24.99 or more on the mobile versions of Pathfinder Adventures before the PC version launches you will qualify for the upgrade DLC and the coupon. Even if you have not spent $24.99 we would like you to get in on the fun. Anyone who has played the mobile version of the game before the PC version launches the 10% off coupon and access to the Edér, Pallegina, and Obsidian Golem promotional cards. It's our way of saying thank you for supporting us. Log in to or create your Obsidian.net account. Link your PlayFab ID and Steam account to your Obsidian.net Account. Download Pathfinder Adventures and stomp some villains. Soon™. It may not be at Pathfinder Adventures PC launch, but it won't be long afterwards. We are working on everything right now and once we have more information about it, we will let you know. Update: It's now available! See the redemption instructions above. That's it for now. Once we get the exact process for reward redemption we will create another post to inform you on how to collect your rewards. Once again the entire Obsidian team would like to thank you for your support over the past year. Any possibility of this working with the GOG version? If I was able to pick, that's the version I'd go with for PC. Thanks again for all the hard work on the app! It's been a blast to play, and I can barely believe that the game has been out for a whole year. In some ways I don't mind the various issues we've encountered over the course of the app's development. After all, it helped foster this wonderful (and often ridiculous) community of Pathfinder players! This is EXCELLENT news, and I appreciate it wholeheartedly! I was not planning to buy the PC version until I saw this. Thank you so much! I think this is very reasonable. Thank you. Also, when you refer to rewards...I assume you mean in Mobile, Challanges, Rewards. Edited by DrDior, 13 June 2017 - 12:19 PM. Long, long way! Hopefully we all see Many more years to come! Your PlayFab ID is the 16-digit code found in the settings menu of the app (PFID). It actually stands for" PlayFab ID" (the game's cloud back-end), not "Pathfinder ID" as a lot of people have just assumed over the course of the last year. I still have a problem. I've looked in the PA mobile settings and in the IOS tablet application settings for PA. There is no 16 char code. Unfortunately, this is only available for Steam at this moment. If anything changes we will let you guys know. Do I have to install Payfab on my tablet or PC to get the PFID that you are referring to? You can find your PlayFab ID by going into Options then Settings. There is a 16 digit ID at the bottom of the menu. I mispoke when I said rewards page. I meant the Products page for your Obsidian.net account. This is where you can usually collect digital rewards from Obsidian games. I'll talk about it more when I write the email about how to redeem your keys. Nope. The game automatically connects to PlayFab and links a PlayFab ID to your account. NOW I see it. I never noticed it below the panel. I may not have scrolled down far enough. So sorry to take your time on this. Edited by DrDior, 13 June 2017 - 12:39 PM. I don't think I want to be a day one supporter of the Steam version despite being a day 1 supporter of the mobile app + board game susbscriber. I still feel too burned over the last year by many of the decisions made. However, I need to understand if by waiting... will I get burned even more despite fitting into the "Ambassador" Description? I have no issue waiting until more content is added to the game or the eventual humble sale or both. I've already invested enough of my money into the economy at this point for the luxury of playing it on the platform I originally wanted to START my adventures on (steam - I never wanted mobile) and a 10% discount doesn't cut it for me personally. Edited by wakasm, 13 June 2017 - 12:48 PM. I don't think I want to be a day one supporter of the Steam version despite being a day 1 supporter of the mobile app + board game. I feel too burned over the last year by many of the decisions made. However, I need to understand if by waiting if I will get burned even more despite fitting into the "Ambassador" Description. I have no issue waiting until more content is added to the game or a humble sale or both. I've already invested enough of my money into the economy at this point and a 10% discount doesn't cut it for me personally. The upgrade DLC key should not expire. As far as I know, Steam keys never expire. The coupon might, but I am unsure of that. Once I find out more I will inform everyone. The answer may be slow since most folks on our end are wrapped up in E3 business. Is it still possible to participate in this awesome action by purchasing "Rise of the Runelords Bundle" via mobile Store today, on 14th? Excited to hear this! I wasn't really interested in buying on PC as well, but this gesture changed my mind. Yes. If you purchase $24.99 worth of content before the PC launch you will be considered part of the Pathfinder Ambassador Program.